Excellent teacher. Sumi was very encouraging. She motivated the new members to do as much as they can while challenging her regular students to improve themselves. Loved this class. Great studio and fantastic instructor. She really walked us through what to do. The regulars were very helpful too. Great as always. Highly recommended. The Saturday 11am class has a few pregnant women also so I would definitely recommend it if you're looking for an easy going class. Love it! Good stretching & Sumi makes it a very safe environment to learn! It was my first time at Iyengar Yoga. It really opened up my eyes on the usage of props. Sumi really guides and walked us through the poses in detail. The stretches was very satisfying. Great experience with passionate instructor Ms Pat. She was very details and go around to checked and adjust our position to ensure everyone is at the right post. She even take time to explained our questions after class. 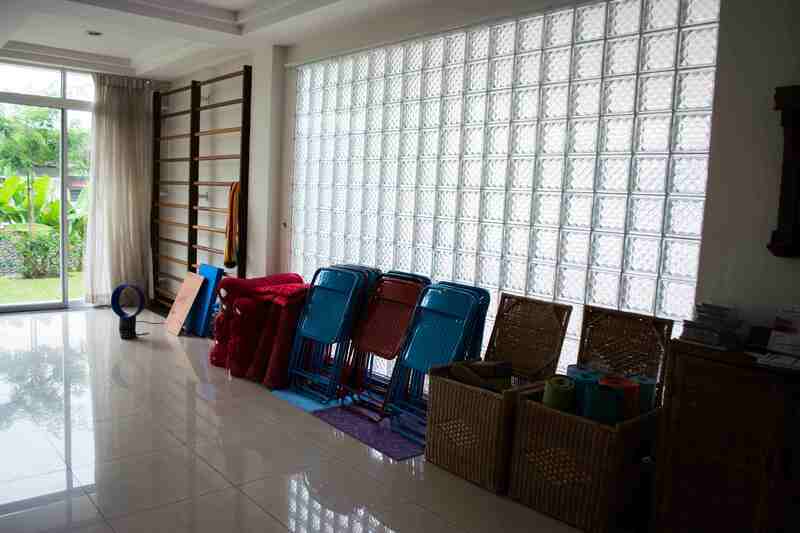 Yoga House is neat, clean and tidy. Keep it up! Will definitely go back again. Pat's class is always awesome! She's very observant , attentive and detailed! At today's session, Sumi infused elements of Pilates in our normal yoga routine. We did a series of deep hip stretches, which were challenging but rewarding. There is always something familiar, and always something new. Highly recommended. Challenging core class - but Sumi made it enjoyable! Awesome session. something that i look forward to. very very good instructor!! teach you the traditional yoga and start with basic. love the ambiance too! 3x visit is not enough! Sumi was awesome, as always. Excellent guidance by Sumi through a series of routines to prepare for back bend poses. As always, lovely crowd, lovely studio and lovely instructor. 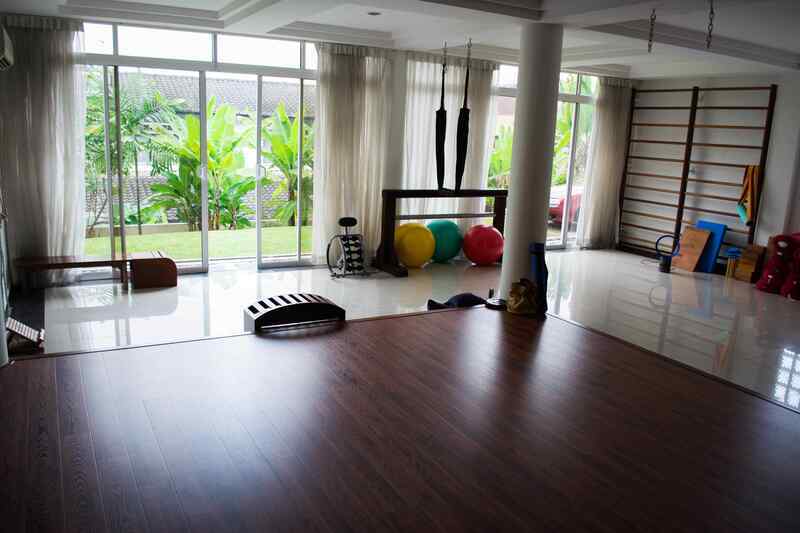 Fantastic ambience and great instructor who focuses on form and structure. Was fun too! Great workout with Sumi after not seeing her for more than 3 weeks. The best yoga teacher on KFit. Thursday Iyengar yoga. Great yoga instructor, step by step learning progress. Love how the props help to get the posture right and Sumi's guidance is great especially for beginners. attentive and encouraging instructor, who is willing to time in more time and extend the session. love the use of props. great! Great for those who have not tried yoga. most beginner class may be a lil too much for newbies. but this class is great as an introduction. light stretching and technique. Great instructor and atmosphere to practice yoga. Definitely will be back! Every strand of muscles being stretched...feeling all refreshed and rejuvenated after the class! Such an smashing experience! Feel stronger, longer and lighter for it!! Love and light to Prem the awesome instructor! Amazing as always! Sumi is an amazing instructor. Firm, focused and ethereal, she is great at giving individual focus even in a group session. To put it strait, it was awesome. this is truely a beginner class so come expecting easy stretch. we did most of the yoga class using a chair to stretch and hold the posses correctly. the instructor is a professional and very involved in everyone's technique. Very good teacher. I love it so much. Sumi is always the great and caring yoga instructor . She always correct our pose patiently and you will definitely feel very comfortable to practise yoga with her assistance. Great as usual. Enjoyed the twisting. She was a great instructor! Really enjoyed Sumi's class as she gives very clear instructions throughout and scales it according to your level. One of the things I like about Sumi's classes is that she tends to focus on different parts of the body each week. To me this is great for beginners who are more serious about learning the asanas properly. This week we were working on hip stretches, and i definitely felt very much more relaxed after all the stretching! Thanks again! Never a dull moment in class with Sumi! Great person-specific instructions and corrections, and encouragement! Learn so much every class. Thanks again! Great leg , especially hamstring, stretches. clear instructions and demos. sumi manages to give everyone personal attention. I've definitely improved under her guidance. thanks! Awesome. So many different and new things to try out at this place. Great place to learn yoga. Sumi really focuses on getting the posture and technique right, and takes time to explain to each person how to do so. Friendly atmosphere, and very suitable for beginners. The right place with a perfect environment and concept to do yoga. I thought I was going for the same beginner class Sumi teaches but it seemed like a slower seniors class. Started before I arrived (I arrived early) and ended before the time mentioned. Perhaps the class was labeled wrong. Excellent. Learn some new steps today. We started a little late but it was worth the wait! Sumi was attentive and quickly corrects my posture. I'll be back! Really liked the class and was suitable for beginners like myself. Sumi was attentive and helped throughout the class. Also loving the location. Iyengar yoga - class was alright. Very supportive teacher that caters to everyone's need. very structured class.. yoga teacher pays attention to every one of her students. Sumitra Sekaran is a very friendly person. She teach 1-to-1. My first time attended her class. Love to attend the meditation class with her again. Good things is She will guide you through everystep. excellent! I always learn something new at Sumi's classes :) and she never fails to give personal attention to everyone. thanks again Sumi! Focused on spinal twists today - much needed and always well instructed by Sumi! Highly recommend Yoga House to everyone! Enjoyable class! Slow-paced but impactful nonetheless. It was my first time ever doing yoga, Thoroughly enjoyed the session! Sumi was spectacular as always! Nice pace with some challenging but satisfying twists and turns. Will keep returning! Great! Was my first time here and it was a good workout to loosen your muscles. The instructor was pleasant and very accommodating. I really like the instructor, she tailored the poses to each individuals body. The poses were deep and challenging, which was just nice for a beginner and at the same time because of her suiting each individual, the more advanced students in the group benefited were challenged too. The place is nice and clean. Great session. Sumi was super supportive! nice to do yoga while birds are chirping. Perfect. Nestled in Section 16, PJ, parking was easy and the session is at peace. Highly recommend for those suffering from back problem including menstruation cramps. As always, a most enjoyable class. It was my first time doing so many spinals twists but it feels liberating and relaxing after! Her regulars also add lots of jokes and laughter to the session! Good long session that passed rather fast. Good indications for beginners. very nice environment, quiet and calm. The class was suitable for beginners, was not too tough to follow with clear instructions. I love the instructor. she is very nice!!! Quiet place, excellent teacher, it's perfect for beginners. Wonderful teacher. Enjoyed the class thoroughly!! Love love love! so good! she was very patience in teaching and Iyengar Yoga can give you a good stretch! It was a great workout especially for those who sit down for long hours. Had an amazing session with Sumi today as usual. Her classes are always perfectly balanced and she's so accommodating to all levels of skill. Always leave with a smile on my face and covered in sweat! very nice class n teacher..the place is perfect. Excellent class, it's a very cozy studio In a house, had plenty of yoga props all in great condition. The Couples and family class is right for beginners or those who want to take it slow or learn basics of Iyengar yoga. Sumi is as good as usual! I enjoyed the class. Sumi was attentive to each of her students. The pace was not too fast. Studio was nice and airy. Birds were chirping in the backyard! Adds a nice touch to the ambience. Sumi was a wonderful teacher and attentive to her students. Highly recommend her beginner class to yoga newbies! very good! peaceful environment, easy parking and great instructor! This week Sumi's class focused on strength exercises. we use various props, and it was challenging but always rewarding at the end of it. Thanks! Small group. Instructor was very attentive. My second time attending and the class was fantastic. Sumi is amazing. It's located in a residential area, and you can park inside the house. The yoga is super nice and suitable for all levels. The best yoga studio and instructor on KFit! I'll come back for more. Good exposure for beginners!definitely coming back for more! Restorative yoga today was such a treat. Will be back! teacher sumi was very good and attentive. will surely come again. Good class as always. Very good instructor, suits the poses to each person's capabilities. Really good! Great emphasis on having correct form, using props to activate the muscles that need to be engaged for each pose. Great as a reminder for non-beginners as well. Sumi is a very attentive and professional instructor. The pace of the class is moderate - suitable for those who are trying yoga for the first time. Very relaxing and its a good experience for beginner to learn on meditation. Best i have been so far in terms of facilities, environment and instructor ! it was relaxing. The instructor, Sumi, was very clear with her instruction and will guide the student through out the class. We had bit of laugh. 😆😆 Thanks yoga house! Thanks Sumi for being so attentive to my mum. She love the class as well as your four legged kids. very good! the instructor was very detailed. Very friendly Yoga instructor and had some fun with the ropes, though a little less technical than expected. The yoga instructor is very good. Love Sumi's classes! She's so attentive to each student's needs and physical differences. The teacher is very instructive which is great for beginners. Try this personalised class rather than the gym ones. The quality of classes are so much better! Perfect time for yoga beginner..
Great, easy to follow for beginners. Amazing! The instructor Sumi is very friendly, and approachable. She notices your poses and will correct you as and when required. Highly recommended ! The chinese instructor was very detailed about each step and she was very helpful. i learn so many new things i didnt know about yoga despite me attending other yoga classes. i truly recommend yoga house. 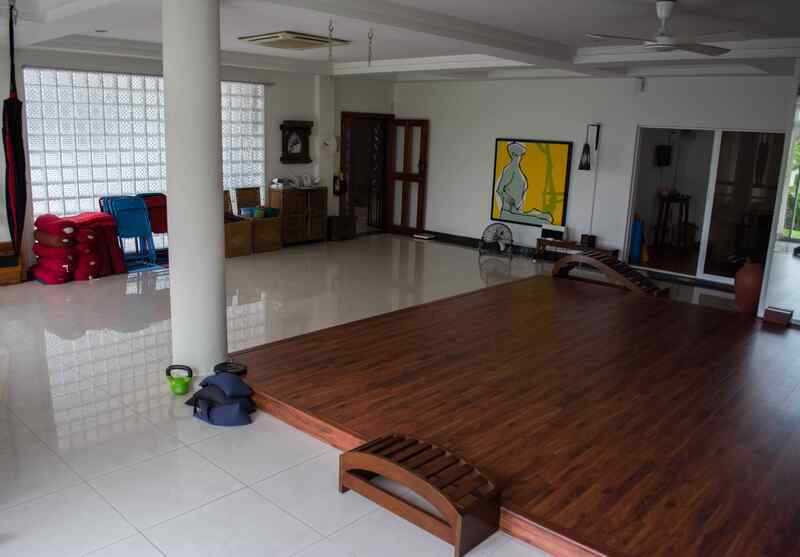 Yoga House is an exclusive boutique-style Yoga studio that is located in the lush and green neighbourhood of PJ, Section 16. 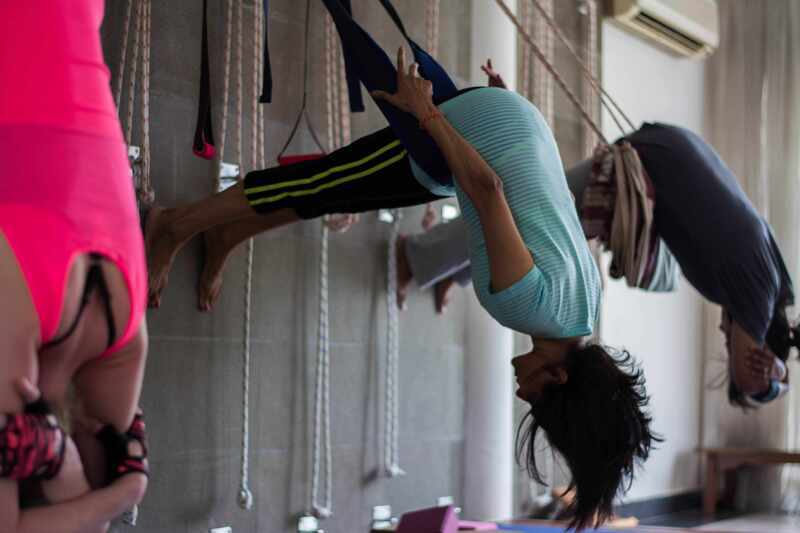 Yoga House is headed by Sumitra Sekaran, who hails from India an dis a certified Iyengar Yoga teacher with over 20 years of experience. 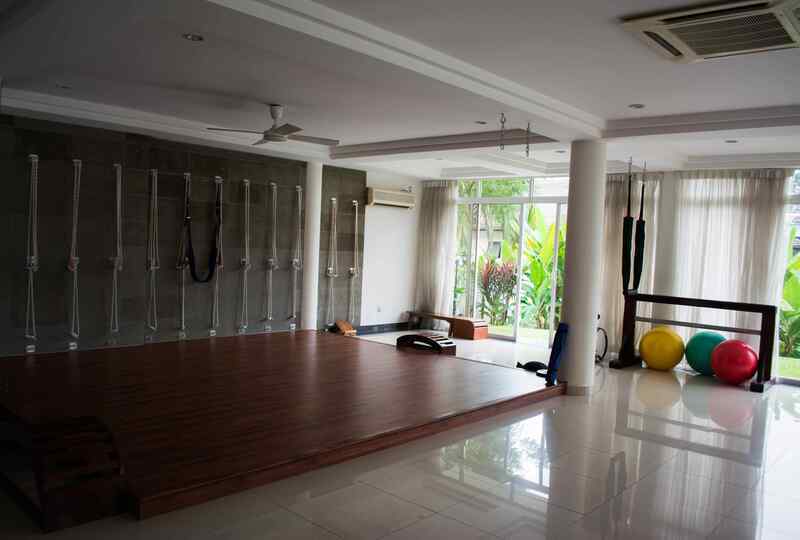 The atmosphere in Yoga House is soothing, calm, and spacious. As a boutique-style studio, classes at Yoga House are smaller sized where teachers will be able to attedn to every single student. An extensive variety of classes are offered, which includes classes for students of all levels and all ages.